This post looks at how I used a competition to grow my mailing list from almost 0 to 238 in 3 weeks. “238? Is that all?” I hear you say. I admit, there are more impressive posts such as How I Grew My List by More Than 2,000 Subscribers in 72 Hours and How to Gather 100,000 Emails in One Week. While both of those posts are great (you should read both of them), they’re both written by people that are well connected and have a following. I, on the hand, don’t. To give you an idea, my blog currently gets around 2,500 uniques a month (up from around 500/month a year ago). I have 570 followers on Twitter. Before running the competition, I had 16 subscribers on my mailing list which I had been collecting on my blog for 4 weeks. This post is hopefully one of encouragement. You don’t have to have a huge following to make a start. In fact, you have to make a start to get a following. Personally, I’m happy with 238. The competition was targeted at the people I wanted to connect to: web designers, developers, freelancers or anyone that works in the web industry. I’d rather 200 people that would potentially care about what I write and say than 1,000 who don’t. Why Start a Mailing List? All of my income comes from the services that I offer to my clients. Over the coming year, I want to diversify where that income comes from1. I’m not sure how I’ll do that yet. A self-published book is a high probability. Whatever I decide to do, the mailing list is the start of a platform I’m building. I’m going to put as much as I can into the articles that I send out in the hope that it builds trust in those who read it. And then, just maybe, they’ll become a customer. Kevin Kelly suggests that you need 1,000 true fans to make a living. I’m not suggesting I have 238 true fans but this is the start of my 1,000. Prior the competition, I added a Mailchimp signup form to every blog post on my website. Over the period of 4 weeks I had 16 email addresses. This was with no promotion, just a couple of friends and a signup form on my website. I saw that James Altucher, the author of one of my favourite newsletters, was running a competition by giving away a set of books. That inspired me. What if I was to run a competition of my own? I could grow my list from 16… what to, I wasn’t sure. I decided to do it. The first task was to pick the prize. 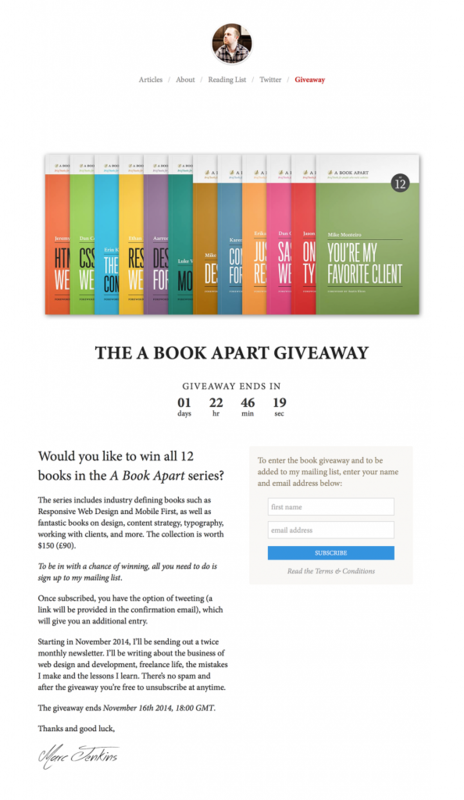 I picked the complete A Book Apart library of 12 books. It fit the criteria: it wasn’t too expensive (around £90 excluding shipping) and it would hopefully appeal to the audience I wanted to attract. The books are specifically aimed at web professionals over a broad spectrum: web design, frontend development, content writing and business. I sent a courtesy email to A Book Apart to ask if they were okay with the idea and if I could use their artwork. They kindly said it was fine with them. I designed a simple landing page for the competition. It included a basic jQuery countdown script and an embedded signup form from Mailchimp. It also included a link to the Terms & Conditions, where I wrote out how the competition would work and how winners would be selected. When the competition launched, to earn an entry you had to sign up to the mailing list AND send a tweet. Once signed up, an automated email was sent out which included a tracked link that sent the user to Twitter with a pre-populated tweet (I used Click to Tweet). A few days into the competition, I changed this so that signing up to the mailing list was one entry and tweeting was a second entry. I had a suspicion (nothing scientific) that some people were put off by the fact that they had to tweet. Making the tweeting optional hopefully eliminated that. As a side note, I thought that adding my Twitter handle might have bumped up my Twitter following. I got an additional 33 followers in the 3 weeks while the competition was running and 32 new followers in the 3 weeks before the competition—it didn’t make much difference. Once the competition was live, I sent out an email to the original 16 members on the mailing list telling them that they were automatically entered into the competition if they sent a tweet. A couple of them did. Over the next couple of days I sent out a handful of tweets and asked a few friends to tweet. I didn’t want to push too hard in the beginning as I wanted to see how it would do organically. The answer is rather badly (there’s a graph in the next section that shows this). I promoted the competition harder in the last week. I was a little worried at this stage that I’d wasted £100 on 30 or so signups. This worked really well. I had responses to around 75% of the messages that I sent. Most signed up and shared the link. A handful kindly rejected saying either they don’t read, they had the books already or that they got enough email as it was. My goal was to attract 100 people to my list. The books cost around £90 (excluding delivery) so with delivery factored in it would be just over £1 per email address. Expensive but hopefully worth it because it was a highly targeted audience. The total signups from the competition was 222 (making a total 238 with the existing 16 email addresses I had). Of the 222, 44% (97 people) decided to then send a tweet. 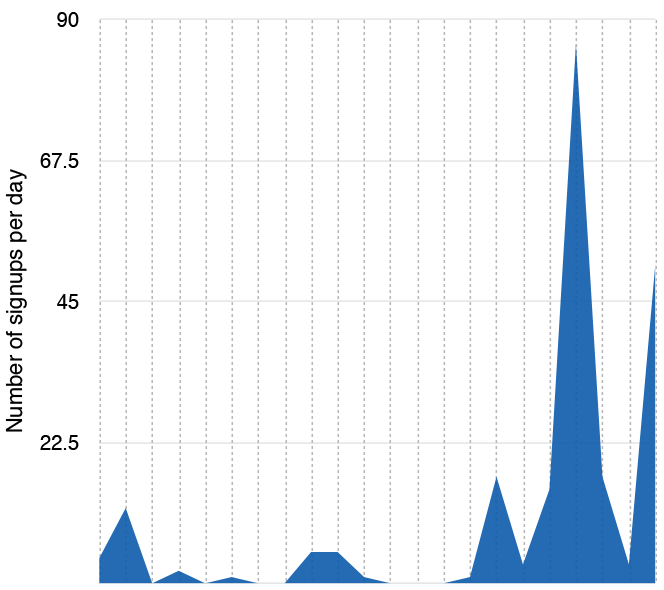 The graph below shows the number of signups that I got per day. The first thing you’ll notice is that I had very little success for the first 14 or so days. The number of signups is directly proportional to the amount of effort I spent promoting it. I fired out a few tweets and emails to friends initially and then pretty much left it untouched until towards the end where I heavily promoted on Twitter. One of the biggest things I got from this experiment (apart from people subscribing to my list) was a whole bunch of new connections. I’m guessing you’re in the web industry. Perhaps you’re a freelancer or thinking of going freelance soon? If so, that’s great! If not, don’t worry; I still hope you’ll get something from what I write. Whoever you are, I’d love it if you could hit reply to this email and introduce yourself. What do you do? What do you care about? Feel free to keep it short if you’re busy. I read and reply to every email that comes my way. This was incredibly effective. Around 10% of my total subscribers emailed me introducing themselves. I read and replied to every one. I also made some new connections when direct messaging on Twitter. Just from reaching out to people, I got a potential lead from someone who was too busy and another two asked me to send them my day rate. I’m not sure any of this will lead to actual work yet but it just shows how getting yourself out there can work in your favour. Even though I was giving away what I thought was a great prize, I was surprised at how many people didn’t enter. I had around a 60% success rate on signups, meaning slightly less than half of the visitors decided they didn’t want to enter. We all get too much email already. I don’t blame people for not wanting yet more email. Another possible reason could be a number of people either already own all or most the books or don’t read at all. The hardest part of this whole process was the final week when I decided to send direct messages on Twitter. Asking people to do something, even though I was giving away something in return, was surprisingly difficult. I believe this fear stemmed from what I thought people would think of me. Would they think I’m trying to buy my success? This was not the case: people were kind, encouraging and willing to spread the word. A tweet has a short life span. I foolishly assumed that my handful of tweets in the early days would inform the majority of my followers. As I direct messaged people, I quickly realised that almost all of them weren’t aware of my competition. Tweets are easily missed so it makes sense to tweet something several times and don’t forget to consider different timezones. Perhaps the biggest mistake I made was not building a mechanism that would allow the competition to spread itself. As mentioned previously, the number of signups was directly correlated with the amount of effort I spent promoting the competition. Rather than getting an entry for signing up and an entry for tweeting (a maximum of 2 entries), imagine if you got an entry for signing up and an addition 3 entries for every person you referred. Pass it to 5 friends and you’d have 16 entries. This kind of mechanic would actively encourage sharing. If you’re using WordPress, you could use something like Kingsumo which has this built in. The fact is, there was no incentive for anyone to spread the word. In fact, the more they promoted it, the less likely they were to win. Had I built a competition that promoted itself, it would have paid to promote heavily at the start and consistently throughout. I focused purely on Twitter to promote the competition. It’s a platform I’m most familiar with and given the time restraints (I’m in the first 3 weeks of my first business) it made sense to put my focus there. I believe there is a lot of opportunity in Facebook, LinkedIn, Reddit and I’m sure many other platforms. I hope this post gave you some insight into my thinking and ideas for running your own competitions. You don’t need a big following to do this. I’ve since out my first newsletter and it seemed to go down well. You can read it online and if you enjoy it, why not sign up! Finally: thank you to everyone who entered and who spread the word. And congrats to Matt Clements on winning the books—enjoy!